Quiet and peacefulsubmitted by Brittney M. - Apr 01, 2013 |Recommended: YesHidden Creek is a great place to reside. Best Apartment Communitysubmitted by Wyatt J. - Jan 10, 2013 |Recommended: YesThe staff is extremely friendly and understanding. They are quick to fix any problems that arise and they follow up with you. Friendly, Efficient, with only minor lacking in following through.submitted by Robert H. - Nov 14, 2012 |Recommended: Yesvery laid back. great balance between price, quality, & location. fun times; like having a chili cook off. Great place to live,cozy, great staff, good neighbors, nice apartments for low price!submitted by Vanessa M. - Nov 12, 2012 |Recommended: YesI have to be honest when I first came to check out Hidden creek I suppose the staff was a little busy and weren't able to show me the apartments themselves and so I wasn't very happy with the service, but decided I would give them another try. So upon arriving they were able to show me all the apartment styles that they offered and were very detailed about everything. I moved in within a month and I love it here. Its really quiet you never have problems with the neighbors. I love that the staff always tries to get envovled with the community by hosting little get togethers here and there.The only bad thing I would say is parking is always crowded at times kind of like a first come first serve type. I just re-newed my lease for another year and I couldnt be happier. Pluse you can't beat the nice scenery as well! Beautiful enviroment. Lovely scenery and top of the line employees.submitted by Jody H. - Sep 08, 2012 |Recommended: YesIt is Heaven on earth. I especially enjoy sitting outside on my patio with my dog and taking the scenery in. Good Starter apartment.submitted by Roger A. - Aug 27, 2012 |Recommended: YesIts quiet, and reasonably priced, its a nice place to live. A homesubmitted by M&M - Nov 08, 2011 |Recommended: YesHidden Creek was awesome. I stayed there in 2008 and I loved it. My sisiter just moved in about a month ago and feels the same way. It was always warm and cozy. We had an insect problem and let the staff know. They were very quick to help us. They took care of the problem the same day. If I had to chose I would definitley move back. Gloria is a complete angel and was always helpful. If you ever have a problem she is the person to help. Very helpful submitted by Beckie B. - Oct 04, 2011 |Recommended: YesI have had nothing but pleasant experiences here. I was leary about moving into a complex like this but I am very happy. The staff has helped me so wonderfuly when I needed to move to a larger apt. They are just great, understanding and timly when fixing any problems. I would recommend to others. I think it's a great and peaceful place to live.submitted by Darlene S. - Oct 03, 2011 |Recommended: YesRight now it's a quiet place to live, it's like living in a house and don't have to worry about the l noise comming from other apartment, and you can sleep peacefully at night. 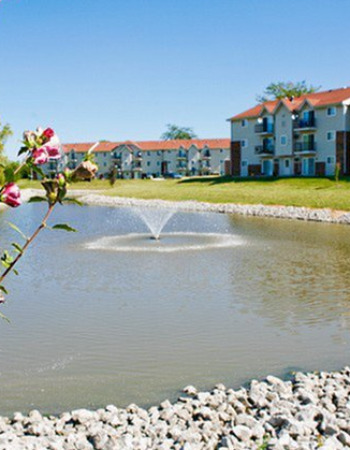 Nice apartments,good rates,great staff !submitted by Kenneth B. - Sep 30, 2011 |Recommended: Yesi would tell them to come by and see Gloria (property manager),take a tour,see the nice settings here at Hidden Creek,watch the wildlife at your window,great place to ride your bike and just get that down to earth feeling,great place to stay,i love it here. Great place to live.submitted by Elizabeth B. - Aug 01, 2011 |Recommended: YesGreat layout and design of apartment, friendly staff, excellent location, bike path entrance at apartment building, friendly neighbors. Nice place.submitted by Andrea S. - Jul 01, 2011 |Recommended: YesI have only lived here for a short time but it has been pleasant, thus far. Quiet and peacefulsubmitted by Adriene J. - Jul 01, 2011 |Recommended: YesThey are very nice apartments. I would recommend them.